"Abstract in Blue & Purple"
Last September my son started law school at the University of Arizona, and around that time he mentiond that he'd like a stained glass artwork for Christmas. 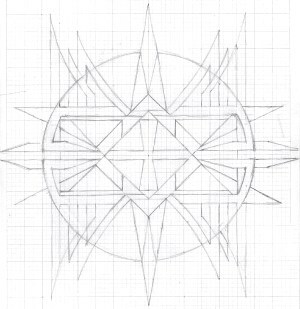 I then had an idea: perhaps a design with a southwestern, Native American design/motif to match his new location. I knew that Glass Eye 2000 would be perfect for the design studies, for the pattern generation, for refining the doodles and for exploring color options, so I got to work. I looked at my various doodles and found one I thought was perfect. It would certainly be the most complex piece I had yet attempted, but I had the time and wanted to give it a shot. I started by scanning the image and importing it as a background image. Next, I went to my favorite glass shop to select the glass. I then headed home for what I felt would be a fun and meaningful project. That evening my son happened to call to say hello. He was doing well and was enjoying his first semester of law school. 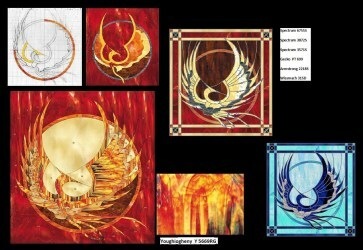 During the conversation, I mentioned a design I had been working on and had posted on Facebook: an abstract phoenix composition I intended to make for one of my wife's friends. The red/yellow motif was what I was planning for this artwork, but as an experiment I had also done a study in blue. He had seen it and liked it, and his preference was for the blue one. When I asked why, he said that he "wasn't really into reds, yellows, oranges and tans." Gulp, I thought, thinking of the glass I had purchased for his Christmas present! Later that evening, my wife asked if I could just change the color scheme, but I didn't think blues would work for that design. Unwilling to change the colors, I went back to the drawing board. As luck would have it, I had recently done a similar doodle. After some massaging, the final scheme came together with blues and purples — and just a bit of red to keep me happy! In the final panel construction (approx. 24" x 24") I replaced the long bevels with clear, iridescent chord glass, which adds to the composition's interest. The piece is copper foil, framed with a zinc border and reinforced vertically and horizontally with copper-coated steel ribbon. 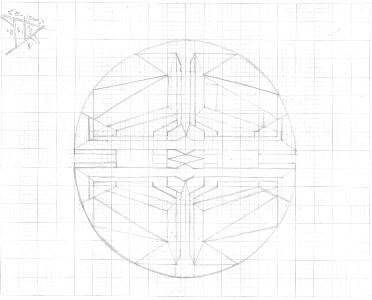 Don spent most of his 30+ year career as a pragmatic, technically-oriented architect (as distinct from a design-oriented architect) who took the concepts of others and made them constructible and enjoyable to inhabit. 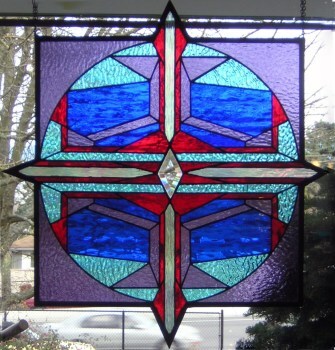 Although he has always loved stained glass, he didn't begin to explore this interest until about a year ago. Don has always loved to doodle. His abstract generated doodles (as he refers to them) range from simple to complex. 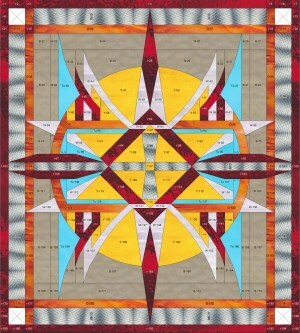 These doodles serve as the springboard for his stained glass patterns as well as his explorations into digital artwork. Now retired, Don is enjoying seemingly endless possibilities. He recently launched his own website, and you may reach him by email. Download "Abstract in Blue & Purple"